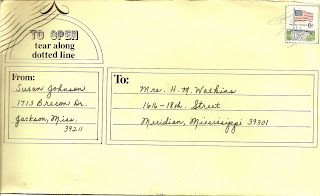 >I just found a letter I wrote to my grandmother in Meridian, Mississippi, on March 11, 1969–forty years ago today. I have a box full of letters I wrote to Mamaw, from the time I was about five years old until years into my marriage, actually. She was a “safe place” to go with my stuff, so I told her about my first kiss and other such intimate things, but also about the fights going on in our home and how I wished my brother would change and my mother would quit yelling at him and most of all that my father would step up and take care of it all. She was such a dear woman. She made most of my clothes until I was in high school. Here’s the outside of the letter–can you believe it only cost 6 cents to mail a letter in 1969? Speaking of 40 years ago, I got a birthday card from a friend I haven’t seen in almost 40 years… she was matron of honor in my wedding in June of 1970! Kathy and I graduated from Murrah High School together in 1969, and a year later, she beat me to the altar by one week. 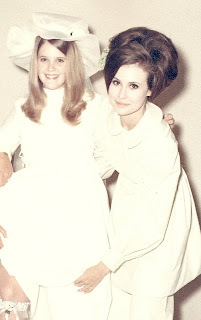 We were in eachother’s weddings in June of 1969. Here she is, helping me with the garter that Bill would throw to the groomsmen. 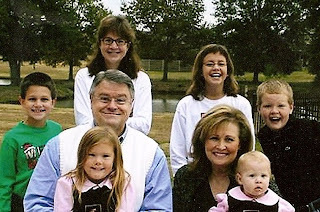 And here she is, in the photo she sent with my birthday card this week, with her husband and their six grandchildren! Can’t wait to see Kathy at our 40th high school reunion in Jackson this summer. Actually, I have a feeling I’ll see her before then….